The Edo period (江戸時代, Edo jidai) or Tokugawa period (徳川時代) is the period between 1603 and 1868 in the history of Japan, when Japanese society was under the rule of the Tokugawa shogunate and the country's 300 regional daimyō. The period was characterized by economic growth, strict social order, isolationist foreign policies, a stable population, "no more wars", and popular enjoyment of arts and culture. The shogunate was officially established in Edo on March 24, 1603, by Tokugawa Ieyasu. The period came to an end with the Meiji Restoration on May 3, 1868, after the fall of Edo. A revolution took place from the time of the Kamakura shogunate, which existed with the Tennō's court, to the Tokugawa, when the samurai became the unchallenged rulers in what historian Edwin O. Reischauer called a "centralized feudal" form of shogunate. Instrumental in the rise of the new-existing bakufu was Tokugawa Ieyasu, the main beneficiary of the achievements of Oda Nobunaga and Toyotomi Hideyoshi. Already powerful, Ieyasu profited by his transfer to the rich Kantō area. He maintained two million koku of land, a new headquarters at Edo, a strategically situated castle town (the future Tokyo), and also had an additional two million koku of land and thirty-eight vassals under his control. After Hideyoshi's death, Ieyasu moved quickly to seize control from the Toyotomi clan. Ieyasu's victory over the western daimyō at the Battle of Sekigahara (October 21, 1600, or in the Japanese calendar on the 15th day of the ninth month of the fifth year of the Keichō era) gave him control of all Japan. He rapidly abolished numerous enemy daimyō houses, reduced others, such as that of the Toyotomi, and redistributed the spoils of war to his family and allies. Ieyasu still failed to achieve complete control of the western daimyō, but his assumption of the title of shōgun helped consolidate the alliance system. After further strengthening his power base, Ieyasu installed his son Hidetada (1579–1632) as shōgun and himself as retired shōgun in 1605. The Toyotomi were still a significant threat, and Ieyasu devoted the next decade to their eradication. In 1615, the Tokugawa army destroyed the Toyotomi stronghold at Osaka. The Tokugawa (or Edo) period brought 250 years of stability to Japan. The political system evolved into what historians call bakuhan, a combination of the terms bakufu and han (domains) to describe the government and society of the period. In the bakuhan, the shōgun had national authority and the daimyō had regional authority. This represented a new unity in the feudal structure, which featured an increasingly large bureaucracy to administer the mixture of centralized and decentralized authorities. The Tokugawa became more powerful during their first century of rule: land redistribution gave them nearly seven million koku, control of the most important cities, and a land assessment system reaping great revenues. 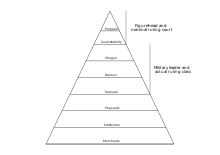 The feudal hierarchy was completed by the various classes of daimyō. Closest to the Tokugawa house were the shinpan, or "related houses". They were twenty-three daimyō on the borders of Tokugawa lands, all directly related to Ieyasu. The shinpan held mostly honorary titles and advisory posts in the bakufu. The second class of the hierarchy were the fudai, or "house daimyō", rewarded with lands close to the Tokugawa holdings for their faithful service. By the 18th century, 145 fudai controlled much smaller han, the greatest assessed at 250,000 koku. Members of the fudai class staffed most of the major bakufu offices. Ninety-seven han formed the third group, the tozama (outside vassals), former opponents or new allies. The tozama were located mostly on the peripheries of the archipelago and collectively controlled nearly ten million koku of productive land. Because the tozama were least trusted of the daimyō, they were the most cautiously managed and generously treated, although they were excluded from central government positions. The Tokugawa shogunate not only consolidated their control over a reunified Japan, they also had unprecedented power over the emperor, the court, all daimyō and the religious orders. The emperor was held up as the ultimate source of political sanction for the shōgun, who ostensibly was the vassal of the imperial family. The Tokugawa helped the imperial family recapture its old glory by rebuilding its palaces and granting it new lands. To ensure a close tie between the imperial clan and the Tokugawa family, Ieyasu's granddaughter was made an imperial consort in 1619. A code of laws was established to regulate the daimyō houses. The code encompassed private conduct, marriage, dress, types of weapons and numbers of troops allowed; required feudal lords to reside in Edo every other year (the sankin-kōtai system); prohibited the construction of ocean-going ships; proscribed Christianity; restricted castles to one per domain (han) and stipulated that bakufu regulations were the national law. Although the daimyō were not taxed per se, they were regularly levied for contributions for military and logistical support and for such public works projects as castles, roads, bridges and palaces. The various regulations and levies not only strengthened the Tokugawa but also depleted the wealth of the daimyō, thus weakening their threat to the central administration. The han, once military-centered domains, became mere local administrative units. The daimyō did have full administrative control over their territory and their complex systems of retainers, bureaucrats and commoners. Loyalty was exacted from religious foundations, already greatly weakened by Nobunaga and Hideyoshi, through a variety of control mechanisms. Like Hideyoshi, Ieyasu encouraged foreign trade but also was suspicious of outsiders. He wanted to make Edo a major port, but once he learned that the Europeans favored ports in Kyūshū and that China had rejected his plans for official trade, he moved to control existing trade and allowed only certain ports to handle specific kinds of commodities. The beginning of the Edo period coincides with the last decades of the Nanban trade period during which intense interaction with European powers, on the economic and religious plane, took place. It is at the beginning of the Edo period that Japan built its first ocean-going Western-style warships, such as the San Juan Bautista, a 500-ton galleon-type ship that transported a Japanese embassy headed by Hasekura Tsunenaga to the Americas and then to Europe. Also during that period, the bakufu commissioned around 720 Red Seal Ships, three-masted and armed trade ships, for intra-Asian commerce. Japanese adventurers, such as Yamada Nagamasa, used those ships throughout Asia. The "Christian problem" was, in effect, a problem of controlling both the Christian daimyō in Kyūshū and their trade with the Europeans. By 1612, the shōgun's retainers and residents of Tokugawa lands had been ordered to forswear Christianity. More restrictions came in 1616 (the restriction of foreign trade to Nagasaki and Hirado, an island northwest of Kyūshū), 1622 (the execution of 120 missionaries and converts), 1624 (the expulsion of the Spanish), and 1629 (the execution of thousands of Christians). Finally, the Closed Country Edict of 1635 prohibited any Japanese from traveling outside Japan or, if someone left, from ever returning. In 1636, the Dutch were restricted to Dejima, a small artificial island—and thus, not true Japanese soil—in Nagasaki's harbor. The shogunate perceived Catholic Christianity to be an extremely destabilizing factor, and so decided to target it. The Shimabara Rebellion of 1637–38, in which discontented Catholic Christian samurai and peasants rebelled against the bakufu—and Edo called in Dutch ships to bombard the rebel stronghold—marked the end of the Christian movement, although some Catholic Christians survived by going underground, the so-called Kakure Kirishitan. Soon thereafter, the Portuguese were permanently expelled, members of the Portuguese diplomatic mission were executed, all subjects were ordered to register at a Buddhist or Shinto temple, and the Dutch and Chinese were restricted, respectively, to Dejima and to a special quarter in Nagasaki. Besides small trade of some outer daimyō with Korea and the Ryukyu Islands, to the southwest of Japan's main islands, by 1641, foreign contacts were limited by the policy of sakoku to Nagasaki. The last Jesuit was either killed or reconverted by 1644 and by the 1660s, Christianity was almost completely eradicated, and its external political, economic, and religious influence on Japan became quite limited. Only China, the Dutch East India Company, and for a short period, the English, enjoyed the right to visit Japan during this period, for commercial purposes only, and they were restricted to the Dejima port in Nagasaki. Other Europeans who landed on Japanese shores were put to death without trial. Social classes during the Edo period (Tokugawa shogunate). Edo society had an elaborate social structure, in which everyone knew their place and level of prestige. At the top were the Emperor and the court nobility, invincible in prestige but weak in power. Next came the shōgun, daimyō and layers of feudal lords whose rank was indicated by their closeness to the Tokugawa. They had power. The daimyō comprised about 250 local lords of local "han" with annual outputs of 50,000 or more bushels of rice. The upper strata was much given to elaborate and expensive rituals, including elegant architecture, landscaped gardens, Noh drama, patronage of the arts, and the tea ceremony. After a long period of inner conflict, the first goal of the newly established Tokugawa government was to pacify the country. It created a balance of power that remained (fairly) stable for the next 250 years, influenced by Confucian principles of social order. Most samurai lost their direct possession of the land: the daimyō took over their land. The samurai had a choice: give up their sword and become peasants, or move to the city of their feudal lord and become a paid retainer. Only a few land samurai remained in the border provinces of the north, or as direct vassals of the shōgun, the 5,000 so-called hatamoto. The daimyō were put under tight control of the shogunate. Their families had to reside in Edo; the daimyō themselves had to reside in Edo for one year and in their province (han) for the next. This system was called sankin-kōtai. The individual had no legal rights in Tokugawa Japan. The family was the smallest legal entity, and the maintenance of family status and privileges was of great importance at all levels of society. The 1711 Gotōke reijō was compiled from over 600 statutes promulgated between 1597 and 1696. During the Tokugawa period, the social order, based on inherited position rather than personal merits, was rigid and highly formalized. At the top were the emperor and court nobles (kuge), together with the shōgun and daimyō. Below them the population was divided into four classes in a system known as mibunsei (身分制): the samurai on top (about 5% of the population) and the peasants (more than 80% of the population) on the second level. Below the peasants were the craftsmen, and even below them, on the fourth level, were the merchants. Only the peasants lived in the rural areas. Samurai, craftsmen and merchants lived in the cities that were built around daimyō castles, each restricted to their own quarter. Outside the four classes were the so-called eta and hinin, those whose professions broke the taboos of Buddhism. Eta were butchers, tanners and undertakers. Hinin served as town guards, street cleaners, and executioners. Other outsiders included the beggars, entertainers, and prostitutes. The word eta literally translates to "filthy" and hinin to "non-humans", a thorough reflection of the attitude held by other classes that the eta and hinin were not even people. Hinin were only allowed inside a special quarter of the city. Other persecution of the hinin included disallowing them from wearing robes longer than knee-length and the wearing of hats. Sometimes eta villages were not even printed on official maps. A sub-class of hinin who were born into their social class had no option of mobility to a different social class whereas the other class of hinin who had lost their previous class status could be reinstated in Japanese society. In the 19th century the umbrella term burakumin was coined to name the eta and hinin because both classes were forced to live in separate village neighborhoods. The eta, hinin and burakumin classes were officially abolished in 1871. However, their cultural and societal impact, including some forms of discrimination, continued into modern times. Edo, 1865 or 1866. Photochrom print. Five albumen prints joined to form a panorama. Photographer: Felice Beato. 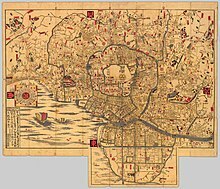 The Edo period bequeathed a vital commercial sector to be in burgeoning urban centers, a relatively well-educated elite, a sophisticated government bureaucracy, productive agriculture, a closely unified nation with highly developed financial and marketing systems, and a national infrastructure of roads. Economic development during the Tokugawa period included urbanization, increased shipping of commodities, a significant expansion of domestic and, initially, foreign commerce, and a diffusion of trade and handicraft industries. The construction trades flourished, along with banking facilities and merchant associations. Increasingly, han authorities oversaw the rising agricultural production and the spread of rural handicrafts. 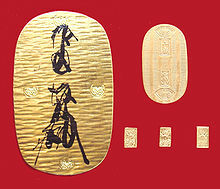 Tokugawa coinage: Ōban, Koban, Ichibuban (1601-1695). By the mid-18th century, Edo had a population of more than one million, and Osaka and Kyoto each had more than 400,000 inhabitants. Many other castle towns grew as well. Japan had almost zero population growth between the 1720s and 1820s, often attributed to lower birth rates in response to widespread famine, but some historians have presented different theories, such as a high rate of infanticide artificially controlling population. Osaka and Kyoto became busy trading and handicraft production centers, while Edo was the center for the supply of food and essential urban consumer goods. Rice was the base of the economy. About 80% of the people were rice farmers. Rice production increased steadily, but population remained stable, so prosperity increased. Rice paddies grew from 1.6 million chō in 1600 to 3 million by 1720. Improved technology helped farmers control the all-important flow of irrigation to their paddies. The daimyō operated several hundred castle towns, which became loci of domestic trade. Large-scale rice markets developed, centered on Edo and Ōsaka. In the cities and towns, guilds of merchants and artisans met the growing demand for goods and services. The merchants, while low in status, prospered, especially those with official patronage. Merchants invented credit instruments to transfer money, currency came into common use, and the strengthening credit market encouraged entrepreneurship. The daimyō collected the taxes from the peasants in the form of rice. Taxes were high, about 40% of the harvest. The rice was sold at the fudasashi market in Edo. To raise money, the daimyō used forward contracts to sell rice that was not even harvested yet. These contracts were similar to modern futures trading. It was during the Edo period that Japan developed an advanced forest management policy. Increased demand for timber resources for construction, shipbuilding and fuel had led to widespread deforestation, which resulted in forest fires, floods and soil erosion. In response the shōgun, beginning around 1666, instituted a policy to reduce logging and increase the planting of trees. The policy mandated that only the shōgun and daimyō could authorize the use of wood. By the 18th century, Japan had developed detailed scientific knowledge about silviculture and plantation forestry. The merchants benefited enormously, especially those with official patronage. The samurai, forbidden to engage in farming or business but allowed to borrow money, borrowed too much. The bakufu and daimyos raised taxes on farmers, but did not tax business, so they too fell into debt. By 1750, rising taxes incited peasant unrest and even revolt. The nation had to deal somehow with samurai impoverishment and treasury deficits. The financial troubles of the samurai undermined their loyalties to the system, and the empty treasury threatened the whole system of government. One solution was reactionary—with prohibitions on spending for luxuries. Other solutions were modernizing, with the goal of increasing agrarian productivity. The eighth Tokugawa shogun, Yoshimune (in office 1716-1745) had considerable success, though much of his work had to be done again between 1787 and 1793 by the shogun's chief councilor Matsudaira Sadanobu (1759-1829). Others shoguns debased the coinage to pay debts, which caused inflation. By 1800, the commercialization of the economy grew rapidly, bringing more and more remote villages into the national economy. Rich farmers appeared who switched from rice to high-profit commercial crops and engaged in local money-lending, trade, and small-scale manufacturing. Some wealthy merchants sought higher social status by using money to marry into the samurai class. A few domains, notably Chōsū and Satsuma, used innovative methods to restore their finances, but most sunk further into debt. The financial crisis provoked a reactionary solution near the end of the "Tempo era" (1830-1843) promulgated by the chief counselor Mizuno Tadakuni. He raised taxes, denounced luxuries and tried to impede the growth of business; he failed and it appeared to many that the continued existence of the entire Tokugawa system was in jeopardy. During the period, Japan studied Western sciences and techniques (called rangaku, "Dutch studies") through the information and books received through the Dutch traders in Dejima. 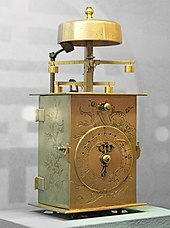 The main areas that were studied included geography, medicine, natural sciences, astronomy, art, languages, physical sciences such as the study of electrical phenomena, and mechanical sciences as exemplified by the development of Japanese clockwatches, or wadokei, inspired by Western techniques. The flourishing of Neo-Confucianism was the major intellectual development of the Tokugawa period. Confucian studies had long been kept active in Japan by Buddhist clerics, but during the Tokugawa period, Confucianism emerged from Buddhist religious control. This system of thought increased attention to a secular view of man and society. The ethical humanism, rationalism, and historical perspective of neo-Confucian doctrine appealed to the official class. By the mid-17th century, neo-Confucianism was Japan's dominant legal philosophy and contributed directly to the development of the kokugaku (national learning) school of thought. Advanced studies and growing applications of neo-Confucianism contributed to the transition of the social and political order from feudal norms to class- and large-group-oriented practices. The rule of the people or Confucian man was gradually replaced by the rule of law. New laws were developed, and new administrative devices were instituted. A new theory of government and a new vision of society emerged as a means of justifying more comprehensive governance by the bakufu. Each person had a distinct place in society and was expected to work to fulfill his or her mission in life. The people were to be ruled with benevolence by those whose assigned duty it was to rule. Government was all-powerful but responsible and humane. Although the class system was influenced by neo-Confucianism, it was not identical to it. Whereas soldiers and clergy were at the bottom of the hierarchy in the Chinese model, in Japan, some members of these classes constituted the ruling elite. Members of the samurai class adhered to bushi traditions with a renewed interest in Japanese history and in cultivation of the ways of Confucian scholar-administrators. Another special way of life—chōnindō—also emerged. Chōnindō ("the way of the townspeople") was a distinct culture that arose in cities such as Osaka, Kyoto, and Edo. It encouraged aspiration to bushido qualities—diligence, honesty, honor, loyalty, and frugality—while blending Shinto, neo-Confucian, and Buddhist beliefs. Study of mathematics, astronomy, cartography, engineering, and medicine were also encouraged. Emphasis was placed on quality of workmanship, especially in the arts. For the first time, urban populations had the means and leisure time to support a new mass culture. Their search for enjoyment became known as ukiyo (the floating world), an ideal world of fashion, popular entertainment, and the discovery of aesthetic qualities in objects and actions of everyday life. This increasing interest in pursuing recreational activities helped to develop an array of new industries, many of which could be found in an area known as Yoshiwara. The region was better known for being the center of Edo's developing sense of elegance and refinement. This place of pleasure and luxury became a destination for the elite and wealthy merchants who wished to flaunt their fortune. Their economy relied primarily on the patronage of such individuals in order to sustain itself. For many of those who inhabited and worked in this region maintaining the illusion of grandeur was the only way of supporting their business. Yoshiwara was home to mostly women who, due to unfortunate circumstances, found themselves working in this secluded environment. Combining factors such as rent, value of their employment contract, cost of clothing, make-up, gift giving, and other expenses ensured that many would spend their entire lives working to pay off their debts. These females were expected to perform dances, sing, play an instrument, gossip or provide companionship so that their guests would come again. As a result, the region developed its own culture which, in turn, determined what would be popular in the rest of the country. This was particularly true for fashion because a woman's identity was determined by her clothing, specifically it clarified what her profession and status was within that field. The quality of her attire ensured that she stood out from the rest of her competition. It was her only means of establishing a reputation and helped to market her talents. However, Yoshiwara also possessed a seedier side. Much of the business conducted here incorporated the use of prostitution as a means to deal with the women's cost of living. As a result, since its establishment was first authorised by Toyotomi Hideyoshi in 1589, this area became the country's government sanctioned red-light district. This designation lasted for about 250 years. Professional female entertainers (geisha), music, popular stories, Kabuki and bunraku (puppet theater), poetry, a rich literature, and art, exemplified by beautiful woodblock prints (known as ukiyo-e), were all part of this flowering of culture. Literature also flourished with the talented examples of the playwright Chikamatsu Monzaemon (1653–1724) and the poet, essayist, and travel writer Matsuo Bashō (1644–94). Matsumura Keibun is one of the most significant painters of this period. His works commonly included realistic depictions of birds, flowers and animals. Ukiyo-e is a genre of painting and printmaking that developed in the late 17th century, at first depicting the entertainments of the pleasure districts of Edo, such as courtesans and kabuki actors. Harunobu produced the first full-colour nishiki-e prints in 1765, a form that has become synonymous to most with ukiyo-e. The genre reached a peak in technique towards the end of the century with the works of such artists as Kiyonaga and Utamaro. As the Edo period came to an end a great diversity of genres proliferated: warriors, nature, folklore, and the landscapes of Hokusai and Hiroshige. The genre declined throughout the rest of the century in the face of modernization that saw ukiyo-e as both old-fashioned and laborious to produce compared to Western technologies. 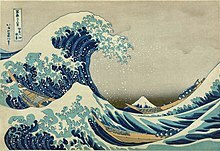 Ukiyo-e was a primary part of the wave of Japonism that swept Western art in the late 19th century. Buddhism and Shinto were both still important in Tokugawa Japan. Buddhism, together with neo-Confucianism, provided standards of social behavior. Although Buddhism was not as politically powerful as it had been in the past, Buddhism continued to be espoused by the upper classes. Proscriptions against Christianity benefited Buddhism in 1640 when the bakufu ordered everyone to register at a temple. The rigid separation of Tokugawa society into han, villages, wards, and households helped reaffirm local Shinto attachments. Shinto provided spiritual support to the political order and was an important tie between the individual and the community. Shinto also helped preserve a sense of national identity. Shinto eventually assumed an intellectual form as shaped by neo-Confucian rationalism and materialism. The kokugaku movement emerged from the interactions of these two belief systems. Kokugaku contributed to the emperor-centered nationalism of modern Japan and the revival of Shinto as a national creed in the 18th and 19th centuries. The Kojiki, Nihon Shoki, and Man'yōshū were all studied anew in the search for the Japanese spirit. Some purists in the kokugaku movement, such as Motoori Norinaga, even criticized the Confucian and Buddhist influences—in effect, foreign influences—for contaminating Japan's ancient ways. Japan was the land of the kami and, as such, had a special destiny. The Edo period was characterized by an unprecedented series of economic developments (despite termination of contact with the outside world) and cultural maturation, especially in terms of theater, music, and other entertainment. For example, a poetic meter for music called kinsei kouta-chō was invented during this time and is still used today in folk songs. Music and theater were influenced by the social gap between the noble and commoner classes, and different arts became more defined as this gap widened. Several different types of kabuki (theater) emerged. Some, such as shibaraku, were only available at a certain time of year, while some companies only performed for nobles. Fashion trends, satirization of local news stories, and advertisements were often part of kabuki theater, as well. The end of this period is specifically called the late Tokugawa shogunate. 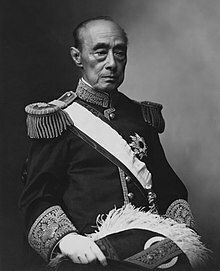 The cause for the end of this period is controversial but is recounted as the forcing of Japan's opening to the world by Commodore Matthew Perry of the US Navy, whose armada (known by Japanese as "the black ships") fired weapons from Edo Bay. 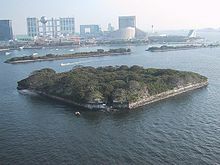 Several artificial land masses were created to block the range of the armada, and this land remains in what is presently called the Odaiba district. The Tokugawa did not eventually collapse simply because of intrinsic failures. Foreign intrusions helped to precipitate a complex political struggle between the bakufu and a coalition of its critics. The continuity of the anti-bakufu movement in the mid-19th century would finally bring down the Tokugawa. Historians consider that a major contributing factor to the decline of the Tokugawa was "poor management of the central government by the shōgun, which caused the social classes in Japan to fall apart". [attribution needed] From the outset, the Tokugawa attempted to restrict families' accumulation of wealth and fostered a "back to the soil" policy, in which the farmer, the ultimate producer, was the ideal person in society. Despite these efforts to restrict wealth and partly because of the extraordinary period of peace, the standard of living for urban and rural dwellers alike grew significantly during the Tokugawa period. Better means of crop production, transport, housing, food, and entertainment were all available, as was more leisure time, at least for urban dwellers. The literacy rate was high for a preindustrial society (by some estimates the literacy rate in the city of Edo was 80 percent), and cultural values were redefined and widely imparted throughout the samurai and chōnin classes. Despite the reappearance of guilds, economic activities went well beyond the restrictive nature of the guilds, and commerce spread and a money economy developed. Although government heavily restricted the merchants and viewed them as unproductive and usurious members of society, the samurai, who gradually became separated from their rural ties, depended greatly on the merchants and artisans for consumer goods, artistic interests, and loans. In this way, a subtle subversion of the warrior class by the chōnin took place. A struggle arose in the face of political limitations that the shōgun imposed on the entrepreneurial class. The government ideal of an agrarian society failed to square with the reality of commercial distribution. A huge government bureaucracy had evolved, which now stagnated because of its discrepancy with a new and evolving social order. Compounding the situation, the population increased significantly during the first half of the Tokugawa period. Although the magnitude and growth rates are uncertain, there were at least 26 million commoners and about four million members of samurai families and their attendants when the first nationwide census was taken in 1721. Drought, followed by crop shortages and starvation, resulted in twenty great famines between 1675 and 1837. During the Tokugawa period, there were 154 famines, of which 21 were widespread and serious. Peasant unrest grew, and by the late 18th century, mass protests over taxes and food shortages had become commonplace. Newly landless families became tenant farmers, while the displaced rural poor moved into the cities. As the fortunes of previously well-to-do families declined, others moved in to accumulate land, and a new, wealthy farming class emerged. Those people who benefited were able to diversify production and to hire laborers, while others were left discontented. Many samurai fell on hard times and were forced into handicraft production and wage jobs for merchants. Although Japan was able to acquire and refine a wide variety of scientific knowledge, the rapid industrialization of the West during the 18th century created a material gap in terms of technologies and armament between Japan and the West, forcing it to abandon its policy of seclusion and contributing to the end of the Tokugawa regime. Western intrusions were on the increase in the early 19th century. Russian warships and traders encroached on Karafuto (called Sakhalin under Russian and Soviet control) and on the Kuril Islands, the southernmost of which are considered by the Japanese as the northern islands of Hokkaidō. A British warship entered Nagasaki harbour searching for enemy Dutch ships in 1808, and other warships and whalers were seen in Japanese waters with increasing frequency in the 1810s and 1820s. Whalers and trading ships from the United States also arrived on Japan's shores. Although the Japanese made some minor concessions and allowed some landings, they largely attempted to keep all foreigners out, sometimes using force. Rangaku became crucial not only in understanding the foreign "barbarians" but also in using the knowledge gained from the West to fend them off. By the 1830s, there was a general sense of crisis. Famines and natural disasters hit hard, and unrest led to a peasant uprising against officials and merchants in Osaka in 1837. Although it lasted only a day, the uprising made a dramatic impression. Remedies came in the form of traditional solutions that sought to reform moral decay rather than address institutional problems. The shōgun's advisers pushed for a return to the martial spirit, more restrictions on foreign trade and contacts, suppression of rangaku, censorship of literature, and elimination of "luxury" in the government and samurai class. Others sought the overthrow of the Tokugawa and espoused the political doctrine of sonnō jōi (revere the emperor, expel the barbarians), which called for unity under imperial rule and opposed foreign intrusions. The bakufu persevered for the time being amidst growing concerns over Western successes in establishing colonial enclaves in China following the First Opium War of 1839–1842. More reforms were ordered, especially in the economic sector, to strengthen Japan against the Western threat. Japan turned down a demand from the United States, which was greatly expanding its own presence in the Asia-Pacific region, to establish diplomatic relations when Commodore James Biddle appeared in Edo Bay with two warships in July 1846. When Commodore Matthew C. Perry's four-ship squadron appeared in Edo Bay in July 1853, the bakufu was thrown into turmoil. 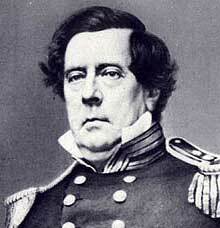 The chairman of the senior councillors, Abe Masahiro (1819–1857), was responsible for dealing with the Americans. Having no precedent to manage this threat to national security, Abe tried to balance the desires of the senior councillors to compromise with the foreigners, of the emperor who wanted to keep the foreigners out, and of the daimyō who wanted to go to war. Lacking consensus, Abe decided to compromise by accepting Perry's demands for opening Japan to foreign trade while also making military preparations. In March 1854, the Treaty of Peace and Amity (or Treaty of Kanagawa) opened two ports to American ships seeking provisions, guaranteed good treatment to shipwrecked American sailors, and allowed a United States consul to take up residence in Shimoda, a seaport on the Izu Peninsula, southwest of Edo. The Treaty of Amity and Commerce Between the U.S. and Japan (Harris Treaty), opening still more areas to American trade, was forced on the bakufu five years later. The resulting damage to the bakufu was significant. The devalued price for gold in Japan was one immediate, enormous effect. The European and American traders purchased gold for its original price on the world market and then sold it to the Chinese for triple the price. Along with this, cheap goods from these developed nations, like finished cotton, flooded the market forcing many Japanese out of business. Debate over government policy was unusual and had engendered public criticism of the bakufu. In the hope of enlisting the support of new allies, Abe, to the consternation of the fudai, had consulted with the shinpan and tozama daimyō, further undermining the already weakened bakufu. In the Ansei Reform (1854–1856), Abe then tried to strengthen the regime by ordering Dutch warships and armaments from the Netherlands and building new port defenses. In 1855, a naval training school with Dutch instructors was set up at Nagasaki, and a Western-style military school was established at Edo; by the next year, the government was translating Western books. Opposition to Abe increased within fudai circles, which opposed opening bakufu councils to tozama daimyō, and he was replaced in 1855 as chairman of the senior councilors by Hotta Masayoshi (1810–1864). At the head of the dissident faction was Tokugawa Nariaki, who had long embraced a militant loyalty to the emperor along with anti-foreign sentiments, and who had been put in charge of national defense in 1854. The Mito school—based on neo-Confucian and Shinto principles—had as its goal the restoration of the imperial institution, the turning back of the West, and the founding of a world empire under the divine Yamato dynasty. In the final years of the Tokugawas, foreign contacts increased as more concessions were granted. The new treaty with the United States in 1859 allowed more ports to be opened to diplomatic representatives, unsupervised trade at four additional ports, and foreign residences in Osaka and Edo. It also embodied the concept of extraterritoriality (foreigners were subject to the laws of their own countries but not to Japanese law). Hotta lost the support of key daimyō, and when Tokugawa Nariaki opposed the new treaty, Hotta sought imperial sanction. The court officials, perceiving the weakness of the bakufu, rejected Hotta's request and thus suddenly embroiled Kyoto and the emperor in Japan's internal politics for the first time in many centuries. When the shōgun died without an heir, Nariaki appealed to the court for support of his own son, Tokugawa Yoshinobu (or Keiki), for shōgun, a candidate favored by the shinpan and tozama daimyō. The fudai won the power struggle, however, installing Tokugawa Yoshitomi, arresting Nariaki and Keiki, executing Yoshida Shōin (1830–1859), a leading sonnō-jōi intellectual who had opposed the American treaty and plotted a revolution against the bakufu), and signing treaties with the United States and five other nations, thus ending more than 200 years of exclusion. This inspired many anti-Tokugawa activists as they blamed the Bakufu for impoverishing the people and dishonoring the emperor. During the last years of the bakufu, or bakumatsu, the bakufu took strong measures to try to reassert its dominance, although its involvement with modernization and foreign powers was to make it a target of anti-Western sentiment throughout the country. The army and the navy were modernized. A naval training school was established in Nagasaki in 1855. Naval students were sent to study in Western naval schools for several years, starting a tradition of foreign-educated future leaders, such as Admiral Enomoto. French naval engineers were hired to build naval arsenals, such as Yokosuka and Nagasaki. By the end of the Tokugawa shogunate in 1867, the Japanese navy of the shōgun already possessed eight Western-style steam warships around the flagship Kaiyō Maru, which were used against pro-imperial forces during the Boshin War under the command of Admiral Enomoto. A French military mission was established to help modernize the armies of the bakufu. Revering the emperor as a symbol of unity, extremists wrought violence and death against the Bakufu and Han authorities and foreigners. Foreign naval retaliation in the Anglo-Satsuma War led to still another concessionary commercial treaty in 1865, but Yoshitomi was unable to enforce the Western treaties. A bakufu army was defeated when it was sent to crush dissent in the Satsuma and Chōshū Domains in 1866. Finally, in 1867, Emperor Kōmei died and was succeeded by his underaged son Emperor Meiji. Tokugawa Yoshinobu reluctantly became head of the Tokugawa house and shōgun. He tried to reorganize the government under the emperor while preserving the shōgun's leadership role. Fearing the growing power of the Satsuma and Chōshū daimyō, other daimyō called for returning the shōgun's political power to the emperor and a council of daimyō chaired by the former Tokugawa shōgun. Yoshinobu accepted the plan in late 1867 and resigned, announcing an "imperial restoration". The Satsuma, Chōshū, and other han leaders and radical courtiers, however, rebelled, seized the imperial palace, and announced their own restoration on January 3, 1868. Following the Boshin War (1868–1869), the bakufu was abolished, and Yoshinobu was reduced to the ranks of the common daimyō. Resistance continued in the North throughout 1868, and the bakufu naval forces under Admiral Enomoto Takeaki continued to hold out for another six months in Hokkaidō, where they founded the short-lived Republic of Ezo. 1600: Battle of Sekigahara. Tokugawa Ieyasu defeats a coalition of daimyō and establishes hegemony over most of Japan. 1603: The emperor appoints Tokugawa Ieyasu as shōgun, who moves his government to Edo (Tokyo) and founds the Tokugawa dynasty of shōguns. 1605: Tokugawa Ieyasu resigns as shōgun and is succeeded by his son Tokugawa Hidetada. 1607: Korean Joseon dynasty sends an embassy to Tokugawa shogunate. 1611: Ryūkyū Islands become a vassal state of Satsuma Domain. 1615: Battle of Osaka. Tokugawa Ieyasu besieges Osaka Castle, all opposition from forces loyal to the Toyotomi family. Tokugawa authority becomes paramount throughout Japan. 1623: Tokugawa Iemitsu becomes the third shōgun. 1633: Iemitsu forbids travelling abroad and reading foreign books. 1635: Iemitsu formalizes the system of mandatory alternative residence (sankin-kōtai) in Edo. 1637: Shimabara Rebellion (1637–38) mounted by overtaxed peasants. 1638: Iemitsu forbids ship building. 1639: Edicts establishing National Seclusion (Sakoku Rei) are completed. All Westerners except the Dutch are prohibited from entering Japan. 1641: Iemitsu bans all foreigners, except Chinese and Dutch, from Japan. 1657: The Great Fire of Meireki destroys most of the city of Edo. 1774: The anatomical text Kaitai Shinsho, the first complete Japanese translation of a Western medical work, is published by Sugita Genpaku and Maeno Ryotaku. 1787: Matsudaira Sadanobu becomes senior shogunal councillor and institutes the Kansei Reforms. 1792: Russian envoy Adam Laxman arrives at Nemuro in eastern Ezo (now Hokkaidō). 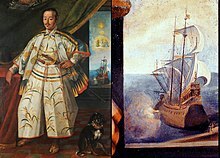 1804: Russian envoy Nikolai Rezanov reaches Nagasaki and unsuccessfully seeks the establishment of trade relations with Japan. 1837: Rebellion of Ōshio Heihachirō. 1854: The USA forces Japan to sign a trade agreement ("Treaty of Kanagawa") which reopens Japan to foreigners after two centuries. 1855: Russia and Japan establish diplomatic relations. 1864: British, French, Dutch and American warships bombard Shimonoseki and open more Japanese ports for foreigners. 1868: Tokugawa Yoshinobu resigns, the Tokugawa dynasty ends, and the emperor (or "mikado") Meiji is restored, but with capital in Edo/Tokyo and divine attributes. The Edo period is the setting of many works of popular culture. These include novels, comics, stageplays, films, television shows, animated works, and manga. ^ Tetsuji Okazaki (2005). "The role of the merchant coalition in pre-modern Japanese economic development: an historical institutional analysis" (PDF). Explorations in Economic History. 42 (2): 184–201. doi:10.1016/j.eeh.2004.06.005. Archived from the original (PDF) on 2012-05-10. ^ Hoff, Frank (1978-06-01). Song, dance, storytelling: aspects of the performing arts in Japan. China-Japan Program, Cornell University. p. 130. ^ Nishiyama, Matsunosuke (1997). Edo Culture: Daily Life and Diversions in Urban Japan, 1600–1868. University of Hawai'i Press. pp. 198–227. Guth, Christine. Art of Edo Japan: the artist and the city 1615-1868 (HN Abrams, 1996). Nishiyama, Matsunosuke, and Gerald Groemer, eds. Edo culture: daily life and diversions in urban Japan, 1600-1868 (University of Hawaii Press, 1997).